In a large Dutch oven, melt the butter. Add the olive oil and sauté the shrimp for 5 to 7 minutes. Season the shrimp with salt, Tony Chachere’s, and lemon pepper while they are cooking. Remove the shrimp and set aside. Sauté the onion, peppers, celery, mushrooms and garlic for 5 to 9 minutes. Add the Rotel tomatoes and the bay leaves. Cook for 10 more minutes. Return the shrimp to the pot and add the crawfish tails; cook for 5 minutes, stirring occasionally. Add the crabmeat, green onions, and parsley. 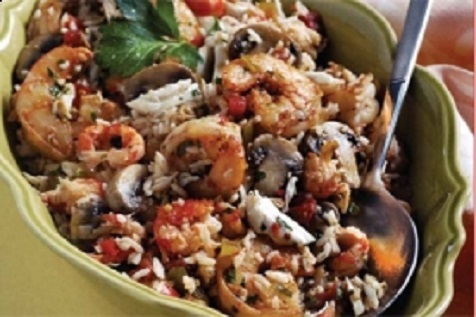 Mix in cooked rice, Adjust seasonings, and remove from heat. Let stand about 5 minutes before serving (for the flavors to marry).